Franciscan Focus: I can't believe I'm professed! Aha! Franciscan blogosphere takeover underway! I can't believe I'm professed! Regional Minister ("minister" is our term for "superior"): "The Formation Director has to lead the procession." Formation Director: "But it says here that the Formation Director follows so-and-so!" RM: "No, you're supposed to be at the front." and consecrate myself to the service of His Kingdom. by observing its Rule of life. 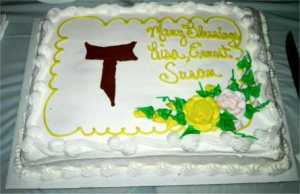 Cake sez: "Many Blessings Lisa, Ernest, Susan"
... felt like I had a flurry of feather dusters tickling my insides all evening (an' still do!) ... since the food at the reception was munchie-type stuff, Husband Mike and I took my mom and a few other folks out to eat afterward ... wasn't able to fall asleep for quite awhile that night. Aaaaaand Thus Concludes my scatter-brained account; hope it made some sort of sense. you're scattered and smothered (like the hash "browns" at waffle house). scattered as in go proclaim the gospel everywhere! and smothered with graces and love!